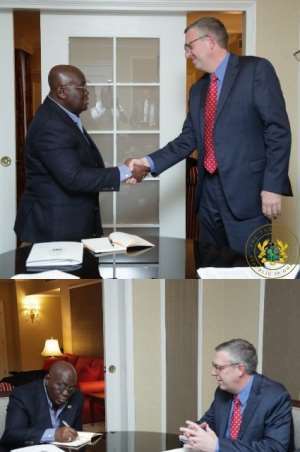 Washington DC, Feb. 25, GNA - The Acting President of the Millennium Challenge Corporation (MCC), Mr Jonathan Nash, has described as "successful" President Nana Addo Dankwa Akufo-Addo's first year in office. Congratulating President Akufo-Addo for the outstanding work he has done to turn Ghana's economic fortunes around within the period, he was optimistic that the Millennium Challenge Compact II agreement with Ghana would have a positive impact on the country's economy under the President's tenure in office. President Akufo-Addo who arrived in Washington on Saturday, would be the first African leader to address the 50 US Governors at an NGA meeting. Mr Nash was upbeat that the $498 million compact would enable Ghana transform her power sector through private sector participation, and the ensuing policy and institutional reforms would provide more reliable and affordable power to businesses and households, as well as boost the nation's economy. 'We are excited about the positive impact and economic growth that can be generated from the investment,' and assured President Akufo-Addo that 'we are ready to stand by your side in whatever way,' he said. President Akufo-Addo, on his part assured that Ghana would meet the September 2018 deadline for the implementation of key agreements stipulated in the Second Compact, as that would enable the release of the remainder of $198 million by the Corporation. The President was hopeful that the Compact would enhance significantly the Electricity Company of Ghana's performance.